A personal story of the rally. The Green Our Vaccines Rally was beautiful. Khalid drove Tom Gomez and me to White Plains. Tom was at my apartment 2 am. We left at 2 am. After getting to the Courthouse and not being able to find the entrance, and after several call, we located our group. Khalid dropped us and drove back. I was praying that he make it back o.k. ; weather was bad and visibility was worse. We waited in Lisa's car until the others came. And that is where I met Nancy Gardello, who had just volunteered to chair the Events Committee. She is an amazing person! We are very lucky to have her on board. Then it was, "lets go" and we ran over, with our umbrellas, braving the rain and waited outside the courthouse for the bus. Lisa and Natalie had brought water, breakfast bars, goodies, and anything you can think off to keep us comfortable. We piled into the bus and took off at 3:45. And then we froze. The temperature had to be sub-freezing in the bus, and outside it was dark and raining. The driver had to keep the temperature low for a number of reasons, but thats another story. I was dressed for a hot day and had no more than a light cotton windbreaker on me. Khalid called me around 4:30 to let me know that he was home. At 5:00 we got to the NJ pick up and promptly got lost. We went all the way in the wrong direction, and several calls later, found our way to the park-n-ride and picked up our NJ friends. And then Lisa started distributing her goodies for breakfast and everyone lightened up. There were children in the bus, fast asleep. Bless them! We walked down the aisles, making acquaintances, sharing experiences, exchanging cards, and chatting all the way. Even I was chatting. Natalie, the organizer, gave out green poster boards and we posted our children's photo on each poster board. Just that weekend, Saadia had given me 4x6 of Omar's.We hit traffic getting close and into DC and got to the Washington Monument at 9:30 am. We stepped out into the hot air and instantly thawed. It had stopped raining and the sun was shining on us. Amy and Mary had taken the sensible train ride, leaving at 5am. So they spent $100 a piece, but they got all that sleep. From that point on, it was sheer heavenly. 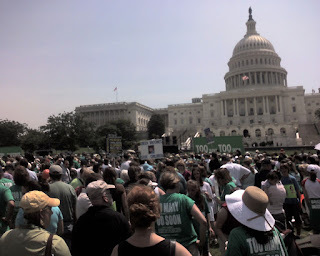 People in green tee-shirts saying 'Green Our Vaccines' were all over the place. We were immediately directed to the site, and all the way, volunteers in green tee shirts were waving us along. I wasn't sure how we would meet up with Amy and Mary. But as soon as we got to the end of the line, there they were, Amy and Mary. And then John Gilmore shows up. We couldn't have planned it better. Cameras were whipped out, and we were posing with our posterboards. The place was lined up with moms and dads with their posters, childrens' photos all over the place, and Green-Our-Vaccine shirts, and posters that said, Too Many Too Soon". We couldn't spot Jenny or Jim, but hey, we were there, and thats what counted. Louis Conte handed out Green Flyers to New Yorkers, on two bills in the Assembly. We started calling out, "New Yorkers? ", and when the hands went up, we handed them the flyer. At 10:00 am promptly, the walk began. We walked out of the monument grounds, onto the boulevard which had been closed to traffic. The cops on their motorcyles were escorting us, and the Press was following on the sidewalks. At one point, I walked up to the Press Photographer, put my poster in front of his camera and said, "Take his picture. This is Omar. He is my grandson, and he was injured by Vaccines'. The camera-man stopped, the reporter stopped, and in the next instant, I was being interviewed. "How old is he? When was he diagnosed? Are you angry? etc etc." And then I waved goodbye and ran over to join my team. In my haste, I didn't ask which network they were covering - darn it! We then stopped by in front of the HHS building and protests rang out. We turned our poster boards to face the building and stood there, protesting. It was exhilarating! A 1.3 mile later, we turned in towards the Capital grounds, and the dome, looming above the green pastures, and thousands of us filing into the grounds, was a breathtaking view. All these parents and grandparents had made it there, took time off, drove and flew long distances, and were there to make a statement for their children. A stage had been set up and the rally began. It had gotten hot and the volunteers were giving out water bottles. Umbrellas brought for the rain, now shielded us from the sun.The first speakers were physicians, one of them from the American Academy of Pediatrics, all in support of cleaning the vaccines, and customizing their administration to the needs of the child, more intervals, etc. Robert Kennedy Jr. spoke at length, and addressing the Press he challenged them on their handling of the vaccine issue. He said to them that each time a piece of research comes out, you (the press) ask CDC for their opinion; you should be reviewing the research and drawing your own conclusions; its not rocket science. He then took each research material, relayed the spin that the CDC had given, and laid out the facts, setting the record straight. Jim Carrey in my opinion, gave the best performance. I call it a performance because it takes star quality sometimes to package an issue. His appeal was factual and emotional. He said that our children are messengers, are special, and their message to us is to make us change agents and clean the world. They were brought here for a reason. Through them we have learnt to love; they have brought a unique gift to us, and it is our calling to open these gifts and share them. Jenny was the last speaker, and she was herself all the way. She always inspires. This time, her speech was scripted, but it was moving nevertheless. At the end, she asked us all to hold up the photos of our children for the Press to see, and as all hands went up, with the photos of children smiling down on us, the music played, and I cried. And then it was over. It almost felt anti-climatic. It felt like unfinished business. I wanted to hold on to the moment, relish it, cry a little more, and just sit there on the grass, enveloping the feeling. But we had to re-group, assemble, find our bus, so we got into action. Amy and Mary were to join us on the bus on the return trip. Lisa Rudley, God bless her, and gone off to see her congresswoman with a few others. We made calls, rounded everyone up, hailed our bus, and piled in. Then we made a few rounds in the bus until Lisa and company caught up with us. Then we were off. Lunch boxes popped open, and we were munching and chatting. People were talking about the rally, about the bills in the Assembly, about the bus trip to Albany next week, about their experiences with Autism, and the bus was buzzing. Lisa filled us in on her conversation with her legislator, and something she said, made me think, "Legislation is as important as Treatment". When we got to NJ, we were beat. Lisa asked the bus driver to pull into a rest area and it was like heaven, to take a break. I just happened to glance up on the TV screen in the rest area, and there it was, or rather, there we were, "Green Our Vaccines Rally". I yelled out to all the others. They were all lined up in front of Starbucks. None of us had had our coffee that day. Those who caught my eye, I didn't know their names. So I yelled, "Rally, On TV," and pointed up to the TV. By the time a few ran up, the moment was gone. By this time, I wasn't looking forward to a bus ride all the way to White Plains. We were planning to take the train back to New York from White Plains. Mary and Amy miraculously came up with Plan B. They are so practical and innovative. Two ladies sitting next to them offered to drive us in their mini-van from the NJ drop off point at exit 8A to the New Brunswick Train station. We could then ride straight into Penn Station. Bless them! There were 4 of us, Tom, Amy, Mary and me. So we got off at South Brunswick, said our goodbyes, and drove off to N.Brunswick. It was a long drive and for them to have taken us out of their way was very very nice of them. I was watching the clock. There was a train at 6pm and the next one at 6:41. If we could catch the 6pm, that would be great. We made it to the station at 5:45 and then we raced up the steps, up the escalator, to the machines. $10.50. Must be wrong. Over to the counter. $10.50 Got our tickets, and then the announcement came. "We apologize......6:15". No problem, at least its not a drive to White Plains. The train got us into Penn Station at 7:30, and it was 'goodbye' and 'see you' and 'get home safe'. I took the cross-town bus and walked in at 8:00 pm. Our work has just begun. Full Spectrum Saunas from Sunlighten - A Great Detox Experience for Anyone!